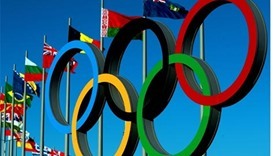 Cricket will return to the next Asian Games at Hangzhou 2022 after the Olympic Council of Asia (OCA) added it to its sports programme for the next edition of the continental event. President of Qatar Olympic Committee (QOC) HE Sheikh Joaan bin Hamad al-Thani has praised the success of the 18th Asian Games Jakarta-Palembang 2018. 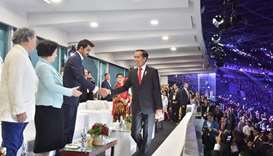 President Widodo said the Asian Games, hosted in Jakarta and Palembang over the past two weeks, have proved Indonesia has the ability to host the Olympics. 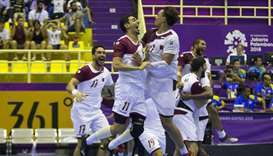 Spectators cheered in the stands as the gold medal-winning Qatari players shook hands with their beaten Bahraini rivals and said “hard luck” to them after their thrilling handball final at the Asian Games Friday. Qatar Handball Association president Ahmad al-Shaabi has dedicated the gold medal won by Qatar handball team in the 18th Asian Games to His Highness the Amir Sheikh Tamim bin Hamad al-Thani. Qatar Olympic Committee (QOC) president HE Sheikh Joaan bin Hamad al-Thani and Asian Athletics Association president Dahlan al-Hamad pose with Qatar's 4x400m relay gold-winning quartet. Qatari equestrian Sheikh Ali bin Khalid Al-Thani won Thursday a silver medal in the jumping event of the Asian Games currently taking place in Indonesia. 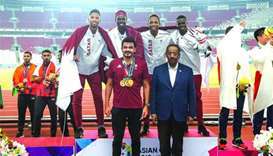 Qatar's Abdullah Abubakr won the bronze medal in the 800m race of the current athletics competition held as part of the 18th Asian Games in Jakarta, Indonesia, until September 2. The Qatari duo defeated Indonesia's Ade Candra and Mohammad Ashfiya 2-0 in the final of the competition. 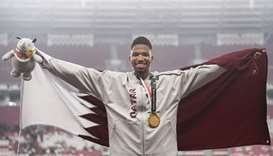 Qatar's Abdurrahman Samba has won the gold medal in the 400m hurdles at the 18th Asian Games, which is currently being held in Jakarta, Indonesia, until 2 September. Qatar will play the final on Friday with the winner of the second semi-final, which was to be played between Japan and Bahrain later on Monday.